When we hear about controllers, some of us will think of those gaming controllers or some of us will think of a tv remote. But in general, controllers are used by us, humans, to be able to interact with the computer. But have you ever thought of using your own body or your skin as the controller? Well it's finally here! Materials scientist from the Seoul National University have developed a transparent forearm touchpad that could replace those traditional button controllers. 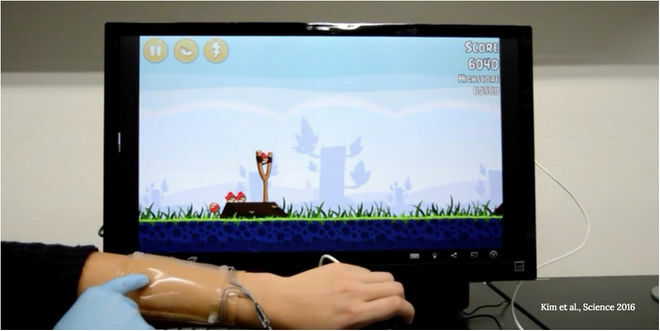 The forearm touchpad is developed from a transparent hydrogel made from polyacrylamide, which is a water-soluble acrylic resin, and lithium chloride salts that acts as a conductor. Electrodes are placed on both ends of the panel creating a uniform electrostatic field. When a part of the panel is pressed, the circuit will close allowing the current to flow to the touch point. Current meters are placed at each corner which is used to pick up the signal and transmit them to a seperate controller board that is connected to the computer. This device is capable of detecting motions such as tapping, holding, dragging and swiping. We might think this technology is similar to the touchpads or to our touchscreen phones right now, but this technology is wearable and the panel is usable even after being stretched of up to 1,000 percent of its original size. Now just imagine having this and the virual reality technology we have now. Want to know more about this awesome device? Follow this Link!